A recent report by the Centers for Disease Control found that while 10.5 percent of all trips in the United States are made on foot, pedestrians made up 13 percent of all traffic fatalities between 2001 and 2010. 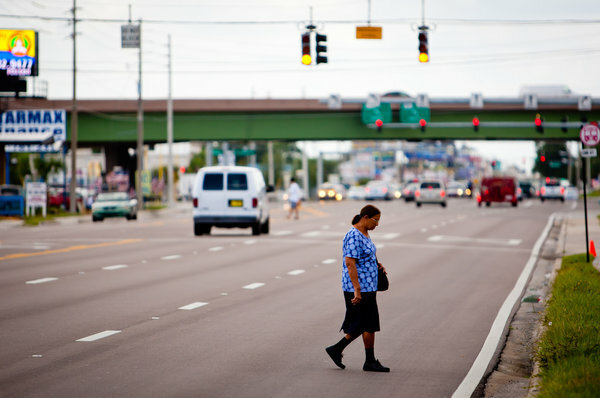 During those years, a staggering 47,392 pedestrians were killed on American roadways. In 2010, the per capita pedestrian fatality rate in America was more than double the rate in the UK and Germany — 13.9 deaths per million people compared to 6.7 and 5.8, respectively, according to figures compiled by the British government [XLS]. The CDC report also highlights the social dimensions of this public health epidemic. Not everyone is affected equally by dangerous walking conditions in America. Elderly and minority populations are at the greatest risk, researchers found, while men of all demographics were two-and-a-half times more likely than women to be killed by a car while walking. Men over age 85 and women between the ages of 75 and 84 suffer a disproportionate share of pedestrian deaths. These high-risk age cohorts were each more than three times as likely to be killed while walking than people between 15 and 24 years of age. As a result, CDC officials predict overall pedestrian fatality rates may increase in the coming years as the American population ages. Pedestrian fatalities also took a high toll on Native American, Hispanic, and black populations. Native American men were four times more likely than white men to be killed while walking, and the fatality rates for black and Hispanic men are about twice that of white men. The disparity was less pronounced for women, but even so, Native American women are roughly twice as likely as white women to be the victim of a fatal pedestrian crash, while Hispanic and black women are 50 percent more likely. The discrepancy may be partly explained by the fact that more people of color tend to live in urban areas, where residents walk more and are more exposed to traffic violence as pedestrians. (The lower level of driving in cities means that urban residents are less exposed to traffic violence overall.) Another factor is that black and Hispanic families are much less likely to own a car than white families, so these populations also walk more than the public overall. From a policy perspective, one implication is that any initiative that increases risk to pedestrians — increasing speed limits, for example — is likely to have inequitable consequences across society. I would further speculate that a contributor to the terrible ped death rates for Native American men could be that many of them are both carless AND living in rural areas with hardly any consideration for the needs of pedestrians at all — potentially a deadly combination. I did not see one word that implies pedestrians are responsible for their health. Is there a point you’re trying to make? Since nearly everyone has elders in their family circle, emphasizing the high rates of death and injury to seniors seems the most politically palatable and powerful approach. I would say that men over 85 suffer a disproportionate share of death, period. The picture is considerably worse when you compare deaths per mile. There’s a direct correlation between ped deaths and speed if there’s any correlation at all. People who live in urban areas might be more likely to get hit by a car but they’re a lot less likely to be killed by one. People driving in urban areas are not only accustomed to expecting pedestrians but also are (usually) driving slower. In Philadelphia there are a lot of poor, middle-class, and wealthy urban neighborhoods where everyone walks everywhere. People don’t get run down in those neighborhoods. They get killed by cars along the major arterials and on the fringes of the city where people drive 50+ mph. The increasing suburbanization of poverty is part of the problem. More people walking and walking to and from bus stops in places with zero thought for pedestrians. The other part is that people who are more prone to risk taking behavior – men and especially men of lower SES – do really dumb stuff as pedestrians (I’m saying this as a guy who hasn’t owned a car in 15 years). In NJ I’ve seen people walk across 6 lane divided highways with traffic in both directions going 55mph – then straddle the concrete divider in the middle until it was “safe” to continue across. When I lived down south I would see people walking on the shoulder of the interstate (a viaduct no less) with their back to traffic and I would see people on a daily basis walking down the center turn lane of busy highways as if it were a sidewalk. Pedestrians in the US are no dumber than those in the UK, etc. but conditions are a lot more dangerous. Most places in the US it is not possible to walk safely. People who can’t drive or don’t have cars have no choice but to walk; even if there is a bus you cannot get to it without walking. has nothing to do with the IQ, but it does have to do with culture. Some cultures are much more dangerous to be a pedestrian in.